Marie was punctured by a sharp tree branch during their camping weekend at the forest. Unconcerned, she just washed off the wound and went ahead with the day’s activities. A few days later at home, she noticed that her wound is getting sore and is starting to take on a tight, glossy appearance. Cellulitis spreads rapidly all over the body, yet cannot spread from one person to another. Cellulitis is a common, potentially serious bacterial skin infection. It indicates a non-necrotizing inflammation of the skin and subcutaneous tissues derived from acute infection. Cellulitis may appear as a swollen, red area of skin that feels hot and tender. Cellulitis mostly arise from breaks in the skin that are not covered or cleaned well. Weak defense. Cellulitis usually follows a break in the skin like puncture wounds, fissures, or lacerations. Entry. Organisms in the skin gain entrance to the dermis and multiply to cause cellulitis. Inflammation. The infected skin would get swollen, red, and tender, and fever may accompany these symptoms. Invasion. If cellulitis is left untreated, the infection could reach the inner layers of the skin and enter the lymph nodes and bloodstream and spread throughout the body. Since cellulitis is not a reportable disease, the exact prevalence is uncertain; however, it is a relatively common infection affecting all racial and ethnic groups. There is a higher incidence of cellulitis in individuals older than 45 years old. There is an incidence rate of 24.6 cases per 1000 persons for cellulitis. In a large epidemiologic study about skin, soft tissue, joint and bone infections, 37.3% of patients were identified as having cellulitis. There are 32.1 to 48.1 visits per 1000 population for skin and soft tissue infections. Visits for abscess and cellulitis increased from 17.3 to 32.5 visits per 1000 population. Cellulitis was found to account for approximately 3% of emergency medical consultations in a general hospital in the United Kingdom. Weak immune system. Bacteria easily lodges to a person who has a weak immune system. Breaks in the skin. Eczema and athlete’s foot, for example, causes breaks in the skin wherein bacteria can enter and cause cellulitis. Intravenous drug use. The insertion site is also a break in the skin that could become the entry point of pathogens. Diabetes. Patients with diabetes experience slow wound healing, and long exposure of wounds could cause infection from pathogens. The signs and symptoms of cellulitis are mostly observable and present on the skin tissues. Tenderness at the affected site. Pain is felt at the site of a developing cellulitis. Inflammation of the skin. As the infection spreads into the inner layer of the skin, inflammation occurs. Skin sore or rash that spread quickly. Due to the invasion of pathogens, the skin develops rashes over the affected site. Tight, glossy appearance of the skin. The skin stretches and becomes taut and shiny-looking due to the swelling. Abscess with pus formation. As the infection worsens, pus and abscess starts to form. Fever. Fever generates as the body fights off the infection. Preventing cellulitis is more favorable than trying to treat one. Here are some tips on how to prevent cellulitis from occurring. Clean thoroughly. Clean the break in your skin immediately and apply antibiotic ointment aseptically. Covering. Cover the wound with a clean bandage and change it regularly until a scab forms. Observe. Watch the affected site for signs of wound infection such as tenderness, discharges, and pain. Cellulitis, if left untreated, could result in more severe complications such as the following. Blood infection. The blood could become contaminated because of the pathogens that enter the blood stream and affect the surrounding tissues. Bone infection. The infection may burrow through the layers of the skin and reach the bones. An inflammation of lymph vessels. When there is infection, the lymph nodes may become inflamed and infected as well. Gangrene. The worst case scenario in cellulitis is if it develops to be gangrene because of the lack of oxygen in the tissues. Determining the extent of cellulitis is important so that the treatment would be appropriate. Blood tests. The physician may order a blood test to rule out systemic or blood infection. Wound culture. A wound culture would be performed to determine the causative factor of the infection. Ultrasound. Ultrasound may play a role in the detection of the abscess and how to treat it. The management of cellulitis focuses mainly in the eradication of the infection. Antibiotic therapy. Antibiotics are effective in more than 90% of the patients and treatment may last from 10 to 21 days, depending on the severity of the condition. Drainage. Abscess need drainage for resolution whatever the pathogen is. Analgesics. Pain relievers are prescribed in some cases. Rest. Rest is necessary until symptoms improve, and while resting, affected area should be raised higher than the heart to reduce swelling. When the tissue affected by cellulitis has reached the worst condition, surgical arrangements may be necessary. Amputation. Amputation would only be required if the affected area becomes gangrenous or necrotic. Management of cellulitis depends on the severity of the affected area. Assessment would be performed to check the etiology and the cause of cellulitis. Past medical history. The nurse may assess the presence of comorbid conditions that may increase the risk of cellulitis. Surgical history. If there is a history of surgery, that procedure may have resulted in wound infection. Physical examination. Physical exam should focus on the area affected. Impaired skin integrity related to altered primary defenses. Disturbed sensory perception related to impaired nerve stimulation. Risk for situational low self esteem related to disturbed body image. Display timely healing of wounds without complication. Maintain optimal nutrition and physical well-being. Participate in prevention measures and treatment program. Verbalize feelings of increased self-esteem. The care for a patient with cellulitis mainly rests on the antibiotic regimen. Secure specimen. Obtain specimen from draining wounds as indicated to determine appropriate therapy. Monitor complications. Observe for complications to monitor progress of wound healing. Clean the area. Keep the area clean and dry and carefully dress wounds to assist body’s natural process of repair. Wound care. Use appropriate barrier dressings and wound covering to protect the wound and surrounding tissues. Create a care plan. Consult with wound specialist as indicated to assist with developing plan of care for potentially serious wounds. The treatment is deemed effective according to the evaluation. Patient displayed timely healing of wounds without complication. Patient maintained optimal nutrition and physical well-being. Patient participated in prevention measures and treatment program. Patient verbalized feelings of increased self-esteem. Care should continue at home as assisted by the significant others. Assist the client and the significant others in understanding and following medical regimen. Assist the client to learn stress-reduction to deal with the situation. Emphasize importance of proper fit of clothing and shoes to avoid reduced sensation or circulation. Impact of condition on personal image or lifestyle. Plan of care and those involved in the planning. Attainment or progress towards desired outcomes. What is the most recommended therapy for patients with cellulitis? C: Antibiotics are the drug of choice for cellulitis since it can eradicate the causative agents. A: Water therapy is necessary for the restoration of the skin condition yet is not the recommended therapy. B: Steroid therapy is not appropriate for cellulitis. D: The answer is antibiotic therapy. Which of the following is not a complication of cellulitis? D: Perineal infection is not a complication of cellulitis. A: Blood infection is one of the complications of cellulitis. 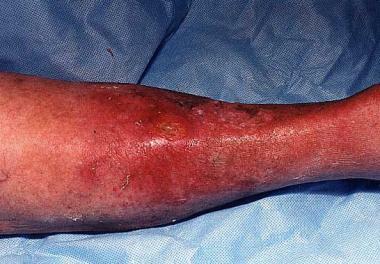 B: Gangrene is one of the complications of cellulitis. C: Bone infection is one of the complications of cellulitis. Why is there a need for wound culture? Wound culture is performed to check for the status of the infection. Wound culture is necessary to determine the causative factor of the infection. Wound culture is done to diagnose infection of the lymph nodes. Wound culture is important to treat cellulitis. B: Wound culture could reveal what pathogen caused the infection. A: Wound culture is not a determinant of the status of the infection. C: Wound culture is not meant for diagnosis of lymph node infection. D: Wound culture is not a treatment for cellulitis. Which of the following is a diagnostic test for cellulitis? A: Ultrasound may play a role in the detection of the abscess and how to treat it. B: Liver function test is not appropriate for diagnosis of cellulitis. C: CT scan for cellulitis is impractical. D: Sputum microscopy is not associated with cellulitis. How does impaired skin integrity occur in patients with cellulitis? The infection reaches the lymph nodes. The infection affects the reproductive system of the patient. The infection damages the upper layers of the skin but it could reach deep into the bones and muscles. The infection only impairs the epidermis. C: The skin is impaired by cellulitis and could also reach the bones and the muscles. A: Infection of the lymph nodes does not denote impaired skin integrity. B: The infection of the reproductive system is not indicative of impaired skin integrity. D: It is not only the epidermis affected in cellulitis but it could also involve the bones and muscles. 1. What is the most recommended therapy for patients with cellulitis? 2. Which of the following is not a complication of cellulitis? 3. Why is there a need for wound culture? A. Wound culture is performed to check for the status of the infection. B. Wound culture is necessary to determine the causative factor of the infection. C. Wound culture is done to diagnose infection of the lymph nodes. D. Wound culture is important to treat cellulitis. 4. Which of the following is a diagnostic test for cellulitis? 5. How does impaired skin integrity occur in patients with cellulitis? A. The infection reaches the lymph nodes. B. The infection affects the reproductive system of the patient. C. The infection damages the upper layers of the skin but it could reach deep into the bones and muscles. D. The infection only impairs the epidermis. C: Antibiotics are the drug of choice for cellulitis since it can eradicate the causative agents. A: Water therapy is necessary for the restoration of the skin condition yet is not the recommended therapy. B: Steroid therapy is not appropriate for cellulitis. D: The answer is antibiotic therapy. D: Perineal infection is not a complication of cellulitis. A: Blood infection is one of the complications of cellulitis. B: Gangrene is one of the complications of cellulitis. C: Bone infection is one of the complications of cellulitis. 3. Answer: B. Wound culture is necessary to determine the causative factor of the infection. B: Wound culture could reveal what pathogen caused the infection. A: Wound culture is not a determinant of the status of the infection. C: Wound culture is not meant for diagnosis of lymph node infection. D: Wound culture is not a treatment for cellulitis. A: Ultrasound may play a role in the detection of the abscess and how to treat it. B: Liver function test is not appropriate for diagnosis of cellulitis. C: CT scan for cellulitis is impractical. D: Sputum microscopy is not associated with cellulitis. 5. Answer: C. The infection damages the upper layers of the skin but it could reach deep into the bones and muscles. C: The skin is impaired by cellulitis and could also reach the bones and the muscles. A: Infection of the lymph nodes does not denote impaired skin integrity. B: The infection of the reproductive system is not indicative of impaired skin integrity. D: It is not only the epidermis affected in cellulitis but it could also involve the bones and muscles.